A range of three phase transformer, designed for optimum performance using low wall loss laminations. 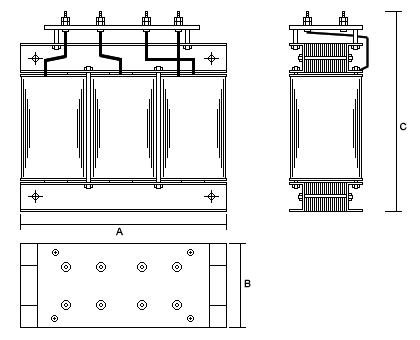 Transformers have terminal block or stud connectors for higher current. Fixing is by angle brackets. Designed to customer requirements with copper earth screen fitted as standard. All transformers are vacuum varnish impregnated in class H polyester varnish. They are designed to operate in an ambient temperature of 30°C without derating. A full range of wall/floor mounted enclosures are available.